A very few - and very real - number of people cannot get numb and have problems with local anesthesia (the "caine" drugs - lidocaine, articaine, prilocaine, etc.). In some, these drugs do not work and the person can actually feel everything being done. In others, there can be frightening and dangerous reactions including passing out and inability to breath! For these people dentistry is, at best, painful and, at worst, life threatening. Because of the pain and danger involved with people like this, it is impossible to perform necessary dental work in the dental office with local anesthesia. The best alternative is to do the work in the hospital operating room under general anesthesia. Whether you can’t get numb or have problems with local anesthesia, we believe that a healthy smile gives an individual more confidence. Our goal is to provide you with dental care that will give you a lifetime of healthy smiles. If you have problems with getting numb or problems with local anesthesia, call Dr. Kurtzman today. 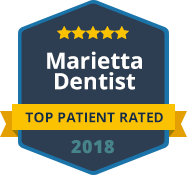 For further information about our dental services, simply call us at: (770) 980-6336 or contact Dr. Kurtzman's Marietta office via email. Our friendly and dedicated staff will schedule an appointment to discuss your individual dental needs. You will find that we strive to make sure all of our clients feel comfortable as possible. When you have a dental emergency and you desire pain free dentistry, Dr. Kurtzman is the right choice!